No one can argue that MWC 2011 was a disappointment for HTC. 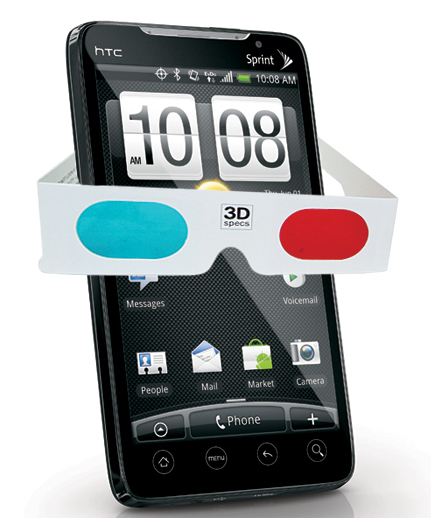 The only thing we got to see was rehashes of old phones in the shape of a Desire S, Wildfire S and Incredible S. However now it seems like HTC was waiting for CTIA to unleash the monster that is the EVO 3D. Rumored specs include 4.3-inch qHD 960 x 450-pixel Autostereoscopic 3D display, 4GB of RAM, 1GB ROM, 1.2GHz dual-core Qualcomm 8660 Snapdragon CPU, dual rear 5-megapixel cameras with dedicated camera button, 1.3-megapixel front-facing camera, and 1730mAh battery which runs on Gingerbread. It doesn’t end there. The EVO 4G will be capable to output 1080p video and 720p 3D video via HDMI output. If this is true it might end up being the most powerful handset ever I would imagine though 4GB of RAM seems a bit of a stretch.